On May 22, the White House hosted a reception for LGBTQ organizers and politicians, including friends and family of the famous gay activist and politician Harvey Milk. The reception was to commemorate the new Harvey Milk postage stamp, which honors the legacy of the courageous member of the San Francisco Board of Commissioners. He became a national symbol of the struggle for equality, but was murdered by a bigot in 1978. His sacrifice helped pave the way for the victories currently being experienced by the movement. Despite the step forward the stamp represents, LGBTQ federal contract workers are not protected from workplace harassment and job insecurity. There has been discussion in the federal government on laws to provide equal protection for those workers, but progress has stalled in Congress. President Obama has not taken any steps to resolve the issue of equal protection for federal contract workers. Activists from across the Washington, D.C., area gathered to demand that President Obama take a stand against anti-LGBTQ workplace discrimination. 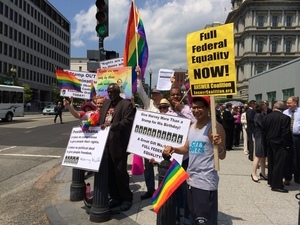 Holding signs saying, “Give Harvey Milk more than a stamp for his birthday,” “Full federal equality now” and “Sign an executive order now!” the ANSWER Coalition and other organizations demanded that all federal workers enjoy equal workplace protections regardless of sexual orientation or gender expression. The ANSWER Coalition demands President Obama stopping hiding behind Congressional deadlock and take a decisive stand against anti-LGBTQ bigotry by signing an executive order banning anti-LGBTQ workplace discrimination.